Winter, and I use the term loosely, might be over here. Since I’ve put that in writing, we could still get hit with a nasty cold day or two out of nowhere, but for now, it’s already starting to feel like spring. So, before the warm weather fully settles in, I wanted to show this hearty, wintery dish. That day when I was flipping through Stir: Mixing It Up in the Italian Tradition , I came across this version of chicken cacciatore. I liked that it was a little different since it’s made with Cornish game hens; it’s a little spicy with some hot pickled peppers included; and there’s no pancetta which I would have left out anyway. There are also no mushrooms, and I like mushrooms very much, but I appreciated the more pointed-up flavor of this cacciatore sauce without them. 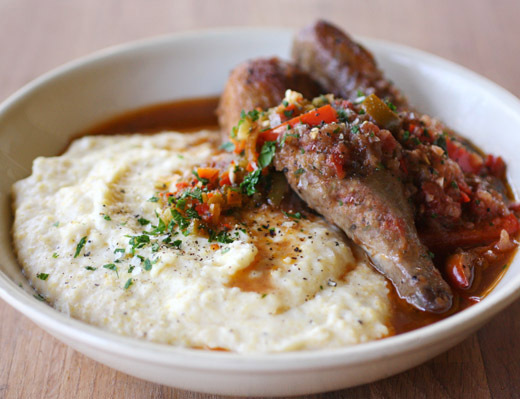 The game hens and sauce are served with my favorite version of polenta. I’ve mentioned this same recipe for it before, and it’s luscious and rich with butter and mascarpone. A very similar cacciatore recipe, which is also from Barbara Lynch, is on the Food and Wine site. 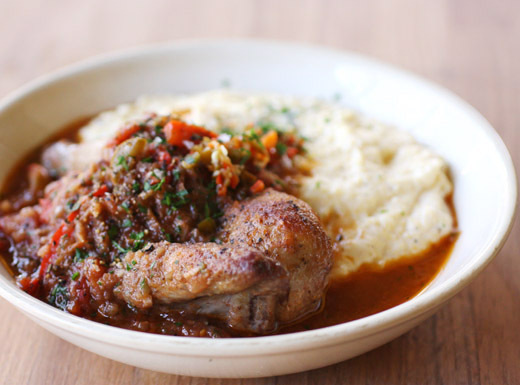 The vegetables and sauce are exactly the same, but in that version, chicken thighs are used rather than game hens and farro risotto is suggested for serving rather than polenta. In the book, it’s suggested that the game hens be cut into six pieces each. I decided to make it a bit more rustic and just cut the hens in half by removing the backbone and cutting between the breasts. The split hens were then browned in olive oil for about eight minutes on each side before removing them from the pan. Over lower heat, onion, bell pepper, hot pickled Italian peppers, and garlic were added and cooked until tender and starting to brown. Then, tomatoes, and I used canned, and red wine were added and allowed to simmer until the liquid was reduced by half. The chicken was returned to the pan, the wine was reduced a bit more, and then chicken stock was added. It was left to simmer until the chicken was cooked through, about twelve to fifteen minutes for halved Cornish hens. Once cooked, the chicken was removed from the pan so the sauce could continue to simmer and reduce for another 30 minutes. Meanwhile, the polenta was stirred and lovely mascarpone was added. Since I had Kurt’s preference for a crispy, seared surface on chicken in mind, I popped the halved hens under the broiler to re-crisp the skins just before serving. Last, I finely chopped more pickled hot peppers and parsley for garnish. As the sauce simmered and I tasted from time to time to check the seasoning, I knew this was going to be good. Once it had reduced, and all those flavors from peppers, tomatoes, and wine had worked their magic, I had one last taste and did a little kitchen-happy-dance. This was an ideal match for the mascarpone polenta, but it would also be delicious with farro risotto, pasta, or a nice hunk of bread. And, it's perfect for a chilly night if you're still having winter. A scrumptious dish! So mouthwatering. This a great combination. I love polenta, and by adding mascarpone to it brought the polenta to another dimension...great meal Lisa. Hope you are having a fun week and Happy Valentine's Day! I hope you enjoyed this scrumptious looking dish last week when we had all that rainy, chilly weather. It looks like the perfect dish for such days. You might indeed be right that winter is over here in Central Texas. While I love these sunny, balmy days, it makes me fear we might be in for a long, hot summer. That polenta must be very tasty after soaking all the gravy! looks amazing and perhaps a new perfect comfort food! This dish looks utterly perfect. Honestly, it looks as if it belongs in a recipe book, most of your recipes do darling! You need one haha. The flavours of this dish must go hand in hand so well. I'm not sure if winter is gone, but it's seventy today! We usually are in the middle of our rainy season in February! The Cornish hens look so enticing atop the polenta I can't wait for a cold spell to try the recipe! I've only thought of marscapone in terms of sweet dishes. My mouth is watering just thinking of it used in the way you suggest, Lisa. I am jealous that your warm days are so near! But I'm glad you shared another cold weather post. Cornish hens are one of my favorite things to prepare. Thank you for sharing with me. I hope you had a fabulous week, and I hope your weekend brims with good food, laughter, and love. I do hope your winter is not over since that means our summer is over. It seems to pass so quickly while winter lasts forever. Winter seems almost over here, too. Still getting some cold weather, but also days where it's close to 70! OK, not many of those, but several - I'll take what I can get! And what I'd love to take would be a serving of this wonderful looking cacciatore. I really like the idea of using a game hen. I'd miss the mushroom, though, and might add them if I were making it. Anyway, really nice post - thanks so much. What a wonderful looking dish - perfect comfort food. It looks like it came from a fancy restaurant. It's still cold here in NY, but we do have sunshine today - plus the daylight is getting longer. I think this looks wonderful, even though I like mushrooms in my cacciatore too. Perfect for winter! Like you, I am cooking some comfort food, and your cornish hens sound just about perfect! What a wonderful and cmforting meal!I love the mascarpone polenta...it sounds creamy and delicious! 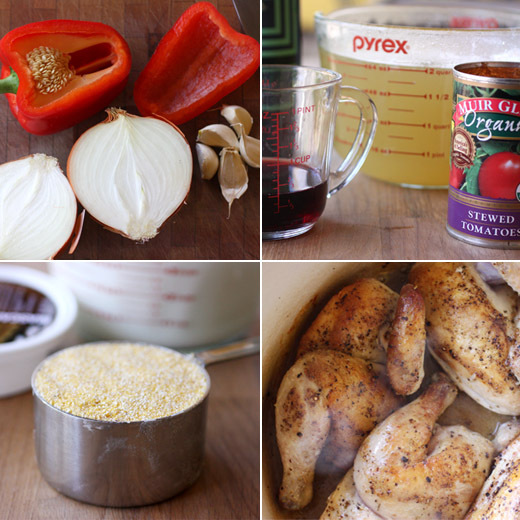 Never tried cornish hens before but love making chicken cacciatore and the polenta sounds delicious as well.